The first American pre-dreadnought, Maine, is also the most famous. Not because she was a good design; in many respects she was an outdated, inferior ship when designed, let alone laid down or completed. Rather the fame came because of her loss, by sabotage or accident (the former furiously held to be true by Americans until 30 years ago). The ship's explosion in Havana would be seized upon as an excuse to launch the Spanish-American War. The order for a new, sea-going armoured ship marks the beginning of the "New Navy." The "Old Navy" had been a collection of rotting wooden frigates, backed up by monitors that had seen little improvement in design, let alone fighting value, since their namesake of 1862. When Maine was laid down in 1888 Congress still thought that the Navy should be a coastal-defence force. The resulting design was really an armoured cruiser rather than a battleship, with two turrets (each with two 10-inch guns) placed on opposite sides of a central armoured barbette. For most officers her primary weapon was her ram, while her protection was limited to 12 inches of nickel steel (equal to about four inches of Krupp armour). If this seems inadequate, remember that at 6,500 tons she was small compared with the contemporary Royal Sovereign class battleships of the Royal Navy, which carried four 13.5-inch guns on a displacement of 14,000 tons. Launching Armored Cruiser #1, USS Maine, 18 November 1889. Engraving from Scientific American. Texas can be considered a battleship variant of Maine, equally small and with similar armour, but carrying two 12-inch guns instead. Laid down a year later she had a better-designed hull, giving her a speed of 17 knots, almost two knots faster than Maine. By the time she entered battle for the only time at the battle of Santiago de Cuba hard service had made her slower and she quickly fell behind the lead ships. Due to her layout only one gun could fire and no hits could be confirmed. Rate of fire was slow, although improved when her mounts were given all-round (but still fixed-angle) loading just before the war. It is, in passing, exceedingly difficult to find any reliable data on the actual rate of fire of American naval guns. Already obsolete when completed, she was turned into a target for heavy guns in 1911. The three Indiana-class ships laid down in 1891 were America’s first true battleships, 11,500 tons and with four 13-inch guns. They were given 18 inches of Harvey steel on the belt which, by the standards of the time was both deep (nearly eight feet) and extensive, covering well over half the length of the hull. However, Congress had stipulated that they were to be "sea going coast-line battleships," which led to some undesirable features. They had limited freeboard which, while it did not mean that they were un-seaworthy, did cause problems with both guns and speed in heavy weather. In this respect although infinitely more capable, they retained the characteristics of the old "sea-going" monitors. In Great War at Sea: Remember the Maine this is why most of the early American battleships are subject to "low-freeboard" rules. Massachusetts, showing her monitor heritage. Their ancient turret design, very little changed since 1865, was another weakness. They were unbalanced (that is with no additional weight at the back end) so that when trained on the beam, coupled with the low free-board, they made the ship list so much that the belt on the high side was above the water-line exposing the ship's tender, unprotected bottom! Incidentally, one other navy, that of Imperial Russia, was having a similar problem at the same time. To persuade Congress that they were the most powerful battleships of their day eight 8-inch guns in two-gun turrets were added. Oregon made a famous navigation of Cape Horn in 1898, rushing from San Francisco to Florida to participate in the attack on Cuba. She and Indiana took part in the destruction of the Spanish cruisers at Santiago (their sister-ship Massachusetts being absent coaling at Guantanamo Bay). The limited capabilities of the class led to their swift decommissioning. By early 1906 all were out of active service and two were used as targets in 1920. The exception was the famous Oregon turned into a museum ship at Portland, Oregon. In a display of institutional ineptitude, the United States Navy decided that they wanted her back in 1942, breaking her up for scrap, which they then did not use. Desperate for warships, Chile attempted to buy all three during her arms race with Argentina, and they appear in Chilean colors in the out-of-print game Cone of Fire. Iowa in her warpaint, 1898, painting by Finlysson. Iowa of 1893 was similar on paper but in reality a much more effective ship. For example, her two funnels were much taller creating more draught and giving her a higher sustained speed. She had a raised forecastle and although given 12-inch guns, rather than the 13.5-inch guns of Indiana, she carried them in the first balanced turrets in the United States Navy. Her belt was thinner (14 inches of Harvey) but even more extensive, covering over three-quarters of the length. 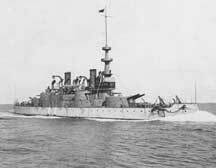 At Santiago she proved by far the most effective battleship, destroying both of the two armoured cruisers she engaged. As a true sea-going ship she lasted longer than the Indiana class, remaining active until 1911. Retained on strength throughout the Great War, Iowa was then converted into a remote-controlled target ship. She was finally sent to the bottom in 1923. The two ships of the Kearsarge class of 1896 were controversial from the first. Unlike most navies, that of the United States was and is subject to the detailed decision input (some would say interference) of its politicians on matters ranging from displacement to gun size. As in this case, an unbalanced design could result. For these ships the problem was that their displacement was limited to being only 1,000 tons more than Iowa but at the same time were required to carry heavier guns (13.5-inch) and a thicker (16-inch Harvey) belt of armour. To make matters worse, the Navy was ordered to dramatically improve the anti-torpedo armament, from the six 4-inch guns of Iowa to no less than fourteen 5-inch guns. The solution was to cut the number of 8-inch turrets in half, but this was only acceptable if both could fire on both broadsides. The result was the bizarre stacked turret, with a smaller mount with a pair of 8-inch strapped on top of the primary turret, so that the entire monstrosity rotated as one. Why a group of senior admirals would accept an idea that forced the secondary armament to fire at the same target as the primary guns is difficult to fathom. It is particularly disturbing to realise that the man who "invented" the idea would later become the admiral responsible for all naval guns and mountings! Seemed like a good idea at the time. The stacked turrets of USS Kentucky. In addition when fitting the big guns into the "lower level" they were mounted at the rear, since the "upper level" was positioned further back. Since adequate elevation was essential the inevitable result was a pair of huge gun-ports. Actually there was one less obvious weakness. Not only was the double-turret very heavy but much of its weight was so high up that it was necessary to reduce the freeboard. The result was yet another design, one that harked back to Indiana, which lacked true sea-going capability. Kearsarge (unique in not being named after a state) and Kentucky were removed from the active fleet in 1909, two years before their predecessor Iowa, evidence that their many weaknesses were quickly recognised. The name-ship did survive until 1955 but only after being stripped of guns and armour and converted into a crane ship, even losing her name in 1941 when it was assigned to a new Essex-class aircraft carrier. The Illinois class of 1896 was a dramatic improvement. The absurd stacked turret vanished and high freeboard returned in a design that was very similar in armament and appearance to the slightly earlier Majestic class of the Royal Navy. They even had the same feature of paired side-by-side funnels and carried 6-inch instead of the 8-inch secondary guns found in earlier American battleships. Another similarity was immediately obvious. The old fashioned circular "Monitor"-style turrets had finally vanished and been replaced by the square cut and balanced mounts that had come into fashion in other navies earlier in the decade. They carried the same 13.5-inch guns as Kearsarge but now they could be mounted close to the sloping front face of the turret, eliminating the older ship’s giant gun-ports. 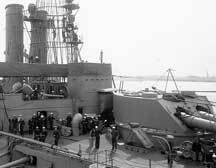 A rapid-fire medium gun was at last available, so the heavy 8-inch gun turrets could be eliminated, allowed the ship to carry fourteen 6-inch guns, all in single armoured barbette or sponson mounts. However they were inferior to contemporary British ships in two ways, one being that the Canopus class used Krupp steel. Unfortunately the American steel makers had the political power to stop the navy using from foreign steel while being unable themselves to make Krupp quality armour. As a result Illinois and her sisters Alabama and Wisconsin had to make do with a belt of 16.5 inches of Harvey steel. The other weakness was their speed, at 16 knots a clear two knots slower than their European contemporaries. Even so, they were the best American battleships yet built and were considered valuable enough to be given a partial modernization 15 years after they were built. The most obvious feature was the cage mast, an item that graced and identified all American heavy warships. They were retained in service through the Great War but only as training ships. 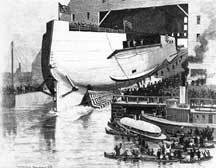 Alabama was used as a target ship, Wisconsin was scrapped and Illinois turned into a floating barracks in New York.